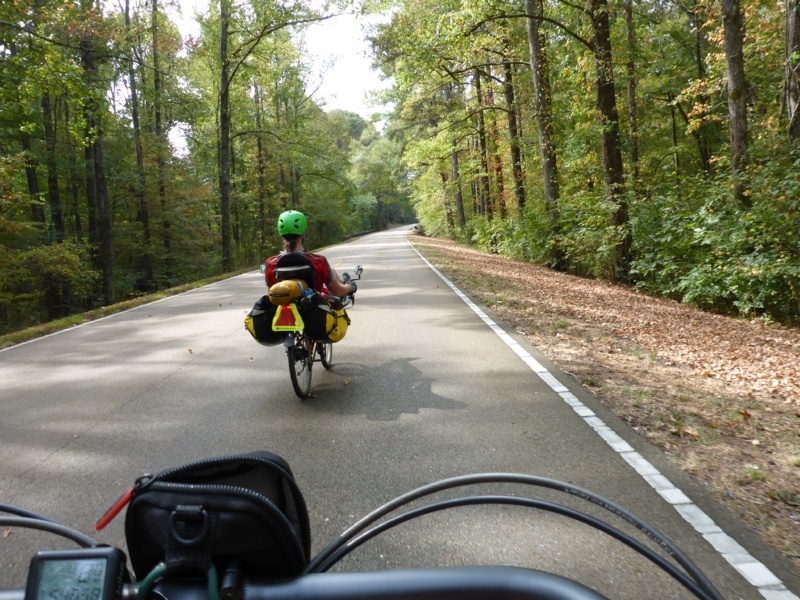 The past few years, Zach and Jennifer have taken a bike trip in the fall, and this year, Jennifer suggested that we bicycle the Natchez Trace Parkway. Part of the reason she suggested it was because it goes through Mississippi, Alabama, and Tennessee, which would get her down to missing just Alaska in her quest to visit all 50 states. 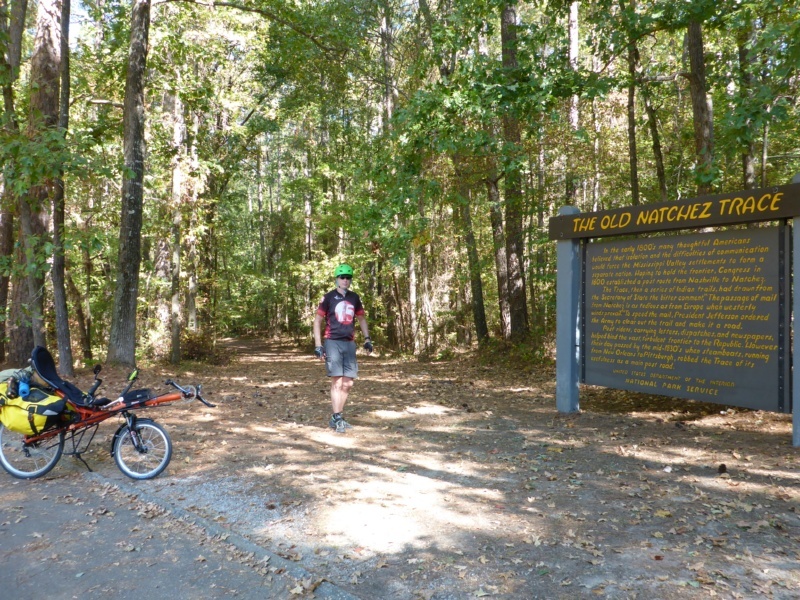 But Zach readily agreed, after finding out that it’s a 444 mile-long scenic and historic National Park, which is promoted as being great for cycling. 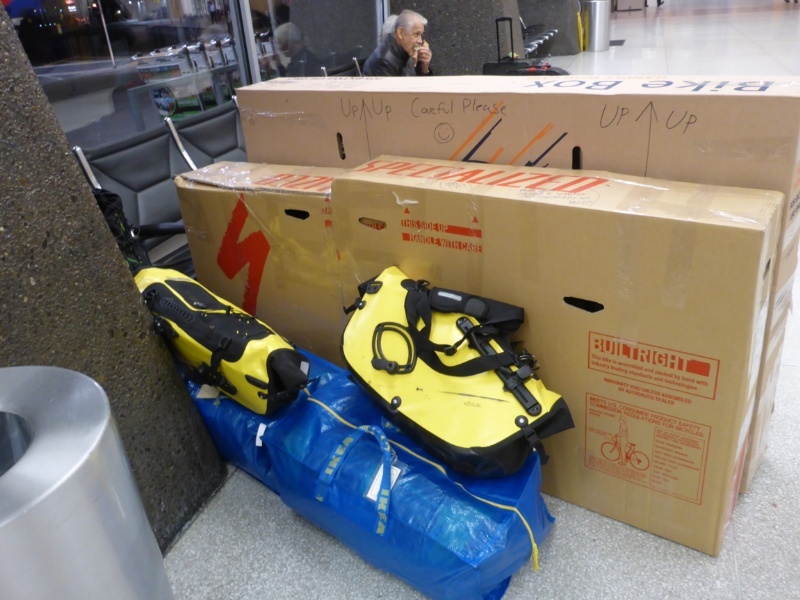 After looking into several options for how to get to and from the Trace, we decided to fly to Nashville with our bikes, ride from there to the north end of the Trace, cycle the entire Trace, and then ride from the southern end on to New Orleans and fly home from there. We figured we’d need about 3 weeks to do this, at our usual not-too-fast pace. So, we set out on October 5th, on a very early morning flight. 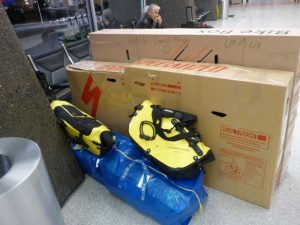 We weren’t sure for a while whether or not Southwest Airlines was going to accept our bikes as luggage, even though we had called them to clarify their baggage rules, but eventually they decided to, and we were quite relieved to see the bikes get unloaded from the plane in our intermediate Denver stop, and arrive undamaged in Nashville. There we reassembled everything and rode about 10 miles to a Warm Showers member’s house, nearly collapsing in the 90 degree heat and not enjoying the heavy traffic much! But we did survive. Our hosts Joe and Sue gave us the “nickel” tour of Nashville (worth every penny! ), and we spent a very pleasant evening swapping cycling stories. The next morning, we rode about 15 miles to the northern end of the Natchez Trace, a mostly pleasant ride passing by a lake and quite a few large rural estates. Our first week on the Trace has also been quite pleasant cycling, aside from the area near Tupelo, which had heavy traffic. We spent our second night out at another Warm Showers member’s house and then we had 6 nights of camping at a mixture of National Park facilities, private campgrounds, and one city park. 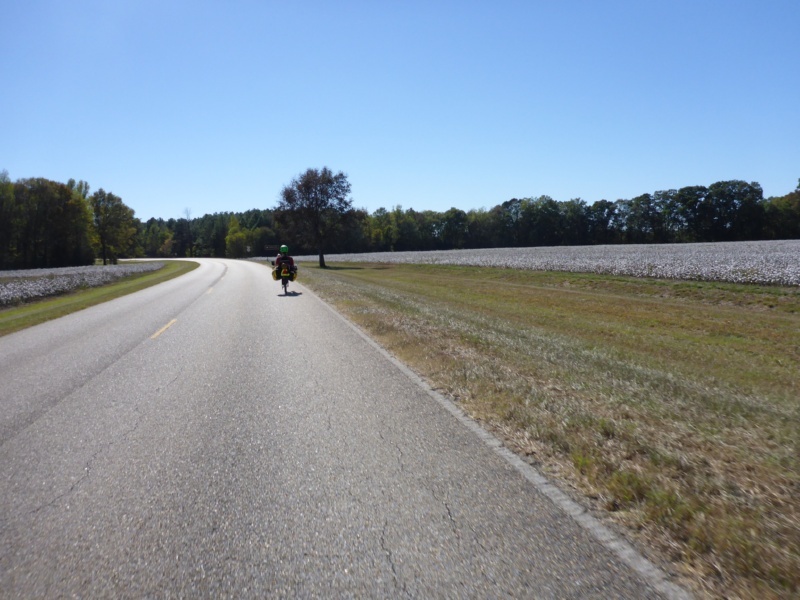 We rode through the Tennessee section of the Trace, across a corner of Alabama, and into Mississippi. Zach’s cousin Russ came to see us one night, which was fun. 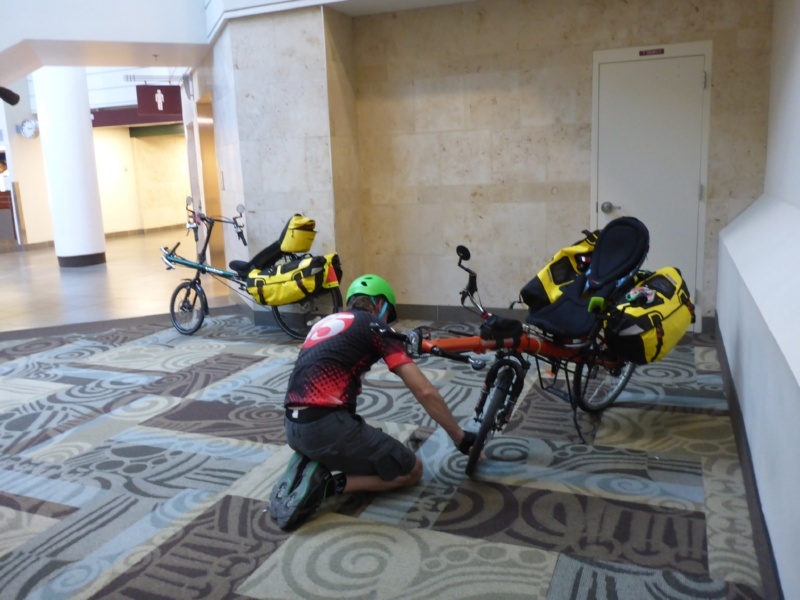 We also met quite a few other cyclists, including a northbound group of 4 people with a car (sharing the driving) who gave us some cold drinks at one spot, a group of 6 people from (of all things) Coeur d’Alene (just 30 miles from where we live! ), and Joe and Jim from Ohio and Michigan, who were traveling at about our pace, so we saw them off and on for several days. 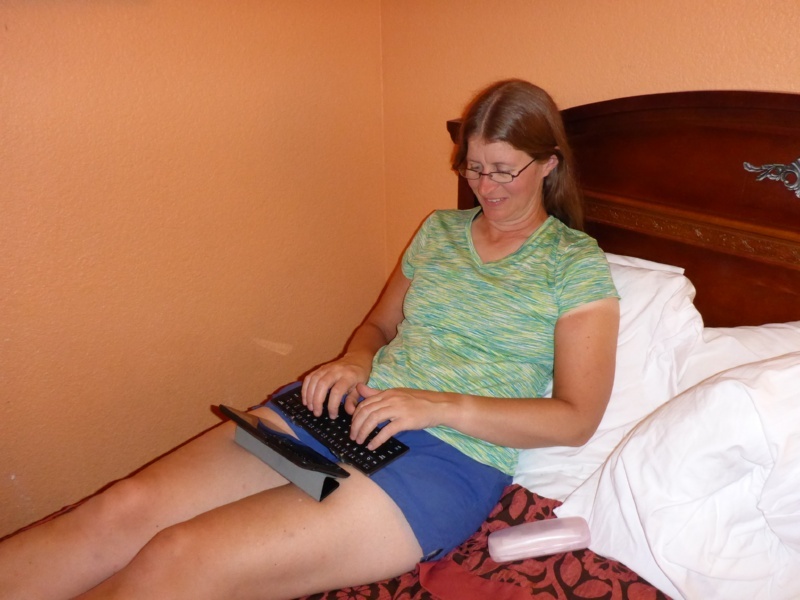 After all that camping, it was time for a break, so as I write this, we’re at a motel in Kosciusko, Mississippi. One of the biggest challenges of cycling the Natchez Trace turns out to be getting food and other supplies. On other trips we’ve taken, we’ve passed through plenty of small towns, and most of them have at least a small store. As long as you’re fairly flexible on what you are willing to eat, you won’t starve. But the Natchez Trace is different. It’s a National Park, and has no commercial development at all, so to get any food or supplies, you have to exit the Trace. We wrote off to the Park Service ahead of our trip, and received a mile-by-mile list of which exits have which services, which was very helpful, but many of the stores are located several miles away from the route — which you’d have to cycle twice. Plus, there’s no guarantee that once you get to a remote store, it will have much or even that it is still in business. So, we found that it was best to stock up for a few days when we got to a larger town with a good store, rather than our usual practice of relying on getting food pretty much every day. 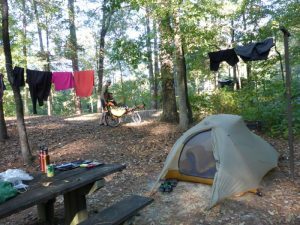 Figuring out where to spend the night is also somewhat of a logistical challenge, assuming that there’s a limit to how far you want to ride in a day. 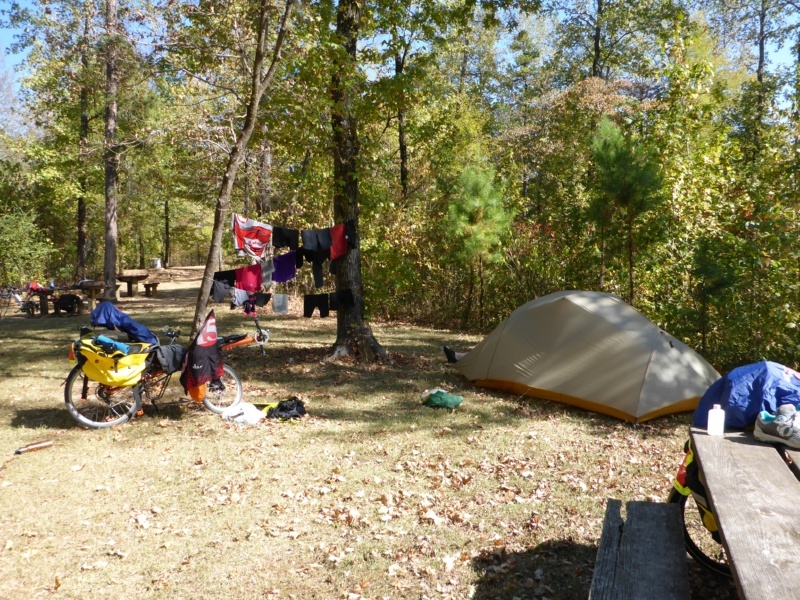 The Park Service information included some campgrounds and some towns with motels; we also got a map of the “Great Rivers South” route from Adventure Cycling — their maps had additional lodging and camping information, which proved to be very helpful. This is the third cycling trip for Jennifer, and the second for Zach, using their maps — and they’ve always been very good. 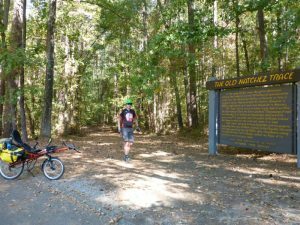 All along the Trace, there are pull-outs with nature trails, historic sites, picnic tables, Native American burial mounds, and other points of interest. Some of them are definitely more interesting than others, but as touring cyclists who aren’t in much of a hurry, we stopped at most of them. Some of them merited a longer look or a bit of walking around; at some we just paused long enough to read the sign; at others we stopped and had a picnic lunch (you need several lunches per day when you’re cycling!). We also had picnic lunches in random shady spots along the road — and then usually we came to a nice pull-out with a picnic table just 5 minutes down the road. Which we’d usually stop at too, at least briefly. 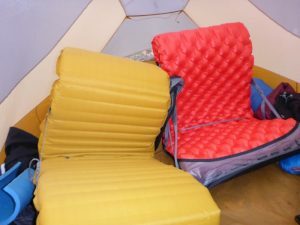 After seeing my sister’s partner Paul’s camp chair on our last backpacking trip, we both got Sea to Summit chair kits, which convert your sleeping pad into a camp chair (Paul has a Therm-a-Rest model, but we liked the Sea to Summit ones a bit better). 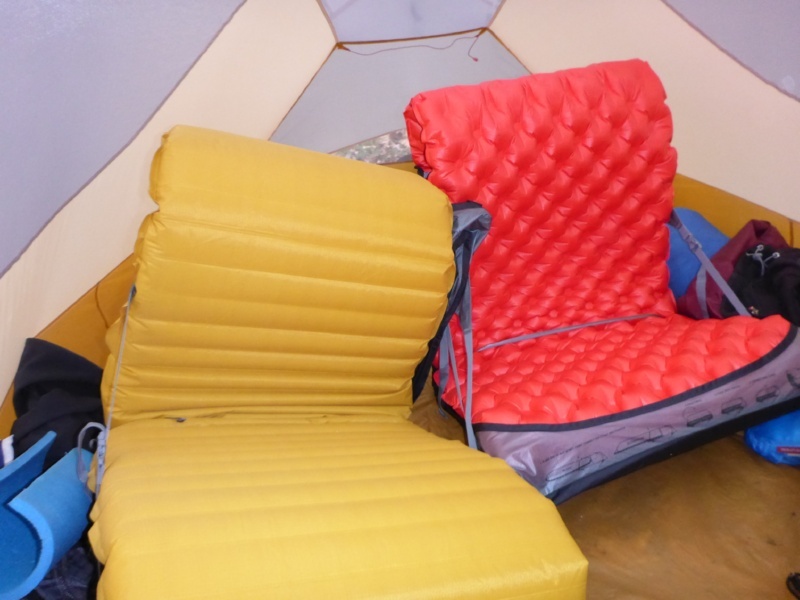 We’ve really enjoyed our time in the tent a lot more with something comfortable to sit on. This area seems to have mosquito swarms around sunset, so it’s good to be able to get in the tent then! Our camp chairs in the tent. Jennifer’s new sleeping pad is the red one. We both got new bicycle helmets this summer. Jennifer started the trend, by getting a smooth-shell helmet (supposedly much better if you crash, because it will slide across the pavement instead of grinding to a sudden stop with a large impact) in high-visibility bright yellow. (See the Bicycle Helmet Safety Institute web site for more information on helmet safety.) Zach got a similar-shaped lime green helmet. Zach’s came with a visor, and Jennifer made a visor out of a baseball cap from a thrift store, by sewing on some double-sided Velcro, so that the visor attaches between the pads and the helmet. 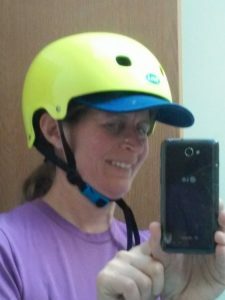 Riding recumbents, you really want a visor on your helmet, due to the upright or even tilted back position of your head. We got an “Ursack” this summer. This is a kevlar bag for food storage, supposedly strong enough to withstand grizzly bears. We used it on several backpacking trips, and we really liked not having to search for a tree to hang the food in, trying to throw the rope over a branch, etc. We brought it on this cycling trip so that we could protect our food from squirrels, deer, and other critters while camping. Jennifer upgraded her rear-view mirrors. She had a small mirror on the left side, and replaced that with a bigger mirror, plus added a new one on the right. It’s always good to see what’s coming up from behind, and when riding with another rider behind you, having two mirrors ensures you can see around them on one side or the other. We also got a new campstove: a Soto Windburner. It uses a butane/propane fuel cartridge, which means you can take the stove on an airplane (without the fuel! ), and it is compact and works very well. We’ve used it on several backpacking trips as well as this cycling trip. Last winter, Jennifer got a 7″ Google tablet (Android) and (after a few tries) a portable folding keyboard to go with it that she could actually type on. She figured out how to do all the steps of blogging using the tablet, including getting photos from the camera to the tablet, resizing and cropping the photos, editing the GPS tracks, and uploading everything to the blog. At home, she uses the tablet as an e-book reader, having finally given up (mostly) reading paper-based books, but this is the first trip she’s tried using the tablet for blogging on (which was part of the reason she bought a tablet instead of a Kindle, like Zach has). If you’re reading this… it worked!